Rising medical expenses number of increased case of heart related disease have combined to make the patient and relatives of patients to be concerned about the cost of medical treatment. Cardiac is one the cardinal part of human body and needs urgent medical care in case of chest pain, heart attack etc. Today it is not about 50 plus the chances of heart ailments are more but heart related problems can even crop up in mid 30’s . The stress and rat race in combination with loads of junk food and irregular life style have given an impetus to heart dieses. In our fast life there is rise in information based knowledge but we hardly get time to take preventive or corrective action for our heart health. The medical insurance is also growing and people are today more aware about the benefits of medical insurance, PPN (Preferred Provider Network) etc. Medical insurance have created the access to quality and required medical treatment to many. Chest pain complains with other symptoms of heart weakness are a large chunk of the reported heart disease cases in most heart hospitals in India. In many cases the doctors suggest angiogram (CAG) after hearing symptoms. In many cases the Angiogram / Angiography reports suggest immediate need for medical intervention like Angioplasty. In some cases it is suggested and advised to be done soon within few days. The typical cases of angioplasty (PTCA) are with blocked or clogged arteries, that is limiting the blood flow to heart and resulting in heart related problems that if ignored can create serious heart related issues or even sudden death. Angioplasty can be done femoral or around groin area (upper thighs) or through wrist. The popular and the latest one is Radial Angiogram done through wrist and also Radial Angioplasty done through wrist. In simple terms the Radial Angiography (Angiogram) and Radial Angioplasty is less painful compared to the usual angiogram and angioplasty through thighs. The patient keeping all other health factors stable recovers faster and starts walking earlier. The patient can even resume work earlier. Angiogram and Angioplasty is done at the Cath-Lab. Radial V\s Non-Radial : The cost of procedure may slightly vary and in few heart hospitals in India that even feature among the best the cost of Angiogram and Angioplasty through thighs and through wrist (Radial) is same. Hospital Charges: In most well known heart hospitals Angiogram is under day care procedure and the patient can go back home after 6-8 hours. In case angioplasty is done on the same day reading the angiogram report the patient will have to stay back till 3 days, considering all other health factors are stable. Procedure costs, fees of doctors / teams, medicines and consumables, tests are also a part of cost. 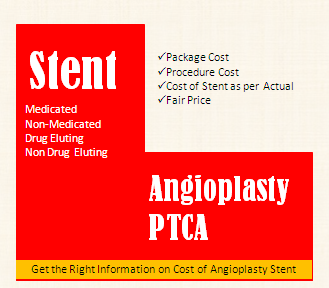 Cost of Stent and Balloon: Angioplasty may require stent/s and balloon. This is estimated by the cardiac surgeons based on the condition of the patient and the required diagnosis reports. Stent/s and balloon are charged as per actual cost of stent and balloon by reputed heart hospitals in India. The hospital in their Angioplasty surgery package charges for procedure cost, doctor team fees, bed and hospital charges and cost of medicines and consumables. It may also include mandatory and required medical tests. Stents can be Drug Eluting and Non-Drug Eluting and they vary in cost. Payments: Medical insurance covers Angioplasty (PTCA) and most medical insurances cover Angiogram (CAG). Patients can also make payments through cash, credit cards, debit cards, Government Health Cards (State [Province] and Union Government), reimbursement schemes and even EMI (Equal Monthly Installments) as per schemes available in certain popular heart hospitals in India.